Wood Street First is a voluntary community group that aims to improve the lives of the community in the Wood Street ward in Waltham Forest. We give support and help to set up committees, other local community groups and projects. We organise lots of events, projects and activities. We will and do respond to the needs, desires, opportunities, expectations, hopes, wishes and challenges we face in our ward. We aim to make Wood Street a better place to live, work and play. The group is run by a committee of local residents. Between 2011 and March 2015 we were part of the Community First initiative launched by the Government. This helped communities come together to identify their strengths and local priorities in order to plan for their future and become more resilient. This Government initiative and the funding has now come to an end and now Wood Street First currently does not receive any direct funding. However, we have decided to continue to support the local community, even though we have no funding ourselves apart from what we raise from our events or the donations made to us events. How do I keep in touch with what Wood Street First is doing? The best way is to sign up for updates on this website. It’s easy: just head for the Home Page, then find and click the ‘Follow’ button on the right of the screen Home Page. Then simply enter your details and you will be notified every time we put up a new web post. If you are on Facebook, you can also keep up-to-date with news of Wood Street First by ‘liking’ our Facebook page. And you can follow us on twitter. How do I become a Volunteer with Wood Street First? Wood Street First is always looking for more volunteers to assist us. The voluntary work can consist of just a few hours a month or becoming more involved by becoming a Committee Member just head to our Volunteers page to find out more. Where is Wood Street ward? Wood Street ward is an area of Walthamstow, and one of 20 electoral wards in the London Borough of Waltham Forest. 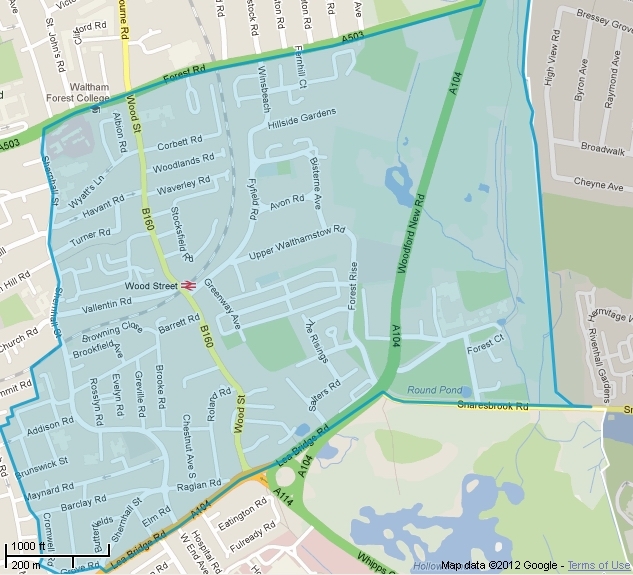 The map below shows where the ward is in the Borough, and most of its streets here..
To find out more about the ward, its services and boundaries, visit this interactive map on the Council’s website, and click on ‘Council Wards and Community Ward Forums’.